$248 – a pretty pop of blue to brighten up a grey day! $298 – i have the travel sized version of this scarf and i love it. so soft and warm! $28 – a nice oversized beanie that will be sure to cover your ears! $175 – a playful sweater that is warm but stylish. $68 – for the house and walks down to the hot tub! $12.50 – i love their camp socks, i own four pairs and they are thick enough to keep your feet warm around the house. $130 – cute and practical! $50 – i have a patagonia down for when it’s really cold but this is a fun playful option for less blustery days. $100 – a fun half zip in a very ski resort friendly print! 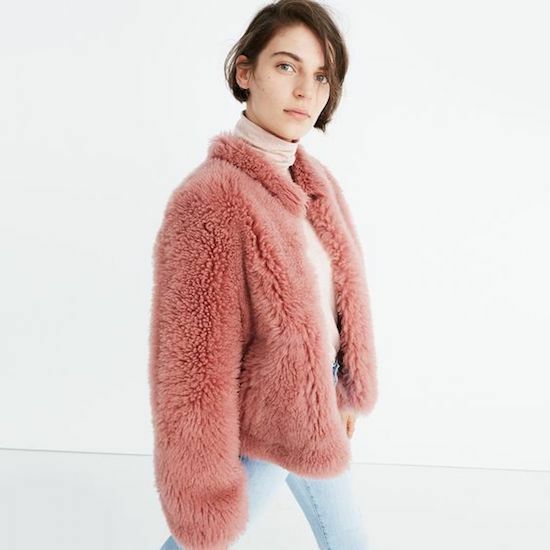 Wow that Madewell fluffy pink jacket looks so cozy, perf for winter! That coat is too perfect! I love your other picks as well. thanks, erin! i booked a last minute ticket last night. looking forward to seeing some snow!